Holly has been a PTA with PTLink since 2014. When not working she enjoys going to local sporting events, anything outdoors, and spending time with her husband and their son. 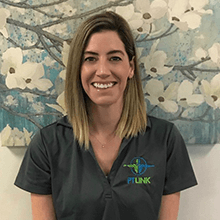 She specializes in chronic cervical/lumbar pain, recently completing a high velocity manipulation course and well as chronic pain course at Ohio State. If you would like to schedule an appointment you can find her at our Sylvania location on Meijer Drive off of Central Avenue.